The following article published in “The Intelligencer Journal of U.S. Intelligence Studies” was written by my friend Andy Vaart, the CIA’s Managing Editor of Studies in Intelligence. He has been involved in some of Perkin-Elmer’s past classified programs including Hexagon. He also served on the President’s Daily Briefing Staff, was an intelligence analyst, manager and editor of various intelligence publications. The article is a tribute to George H.W. Bush and his dedication to the CIA staff and especially to the importance in reading the Daily CIA Intelligence Briefings. Over enough time, intelligence officers—at least this intelligence officer—might be inclined to mark epochs in their careers by the presidents they and the Intelligence Community have served. The death this past weekend of George Herbert Walker Bush brings to my mind, in both sadness and joy, a 12-year period in which intelligence was held in the highest regard by the most senior consum- er in the land. Much of the flavor of this tumultuous pe- riod is nicely reflected in recollections of President Bush that were rolled out in www.cia.gov the weekend after his death on the night of 30 November. For those of us fortunate enough to have served on the President’s Daily Brief Staff during the 12-years Mr. Bush—as vice president and then president (1981–93)— received the PDB, no labor was too intense to produce the needed story and no hours were too many or too late to make certain we—the authors, the day and night editorial teams, the designers, and the briefers—made it good and got it right. This may have been true with later presidents, but what stood out with President Bush was that we, thanks to his dedicated briefers, Charles A. Peters (usually addressed as “Chuck” or “Pete”) and Henry (Hank) Ap- pelbaum (a predecessor of mine in my present job), knew well that the effort was truly appreciated. We heard it in daily debriefings, and we frequently saw it in handwritten personal notes. As a staff editor, even I received one. a. Charles A. Peters, “Intelligence for the Highest Levels: Serving Our Senior Consumers,” Studies in Intelligence 39, no. 3 (Septem- ber 1995). Available in cia.gov FOIA Electronic Reading Room. I was frankly flattered, but I reminded him that the Director of Central Intelligence (DCI), who was by statute his intelligence adviser, might have something to say about the arrangement. Of course, the convention came off without a hitch, and the Vice President won the election convincingly. On 21 January, the day after the inauguration, there- fore, we gathered for the first time in the Oval Office. Present, as was the custom in the Bush presidency, were Chief of Staff John Sununu, National Security Adviser Brent Scowcroft, and Deputy National Secu- rity Adviser Bob Gates. DCI Webster also was there. (Image on the left.) And that led to the first of a long series of informal bits of byplay that were to mark our daily sessions. All statements of fact, opinion or analysis expressed in this article are those of the author. Nothing in the article should be construed as asserting or implying US government endorsement of its factual statements and interpretations. have to search out an Office of Comic Relief and authorize a major shakeup. What would follow during his presidency were the addi- tion to the PDB of a section called “Signs of the Times,” which brought into the book the amusing, the idiosyncrat- ic, or the uncommon that might lighten, for a moment, the mood of an otherwise challenging and potentially de- pressing period. A couple of examples from Pete’s article. Though not a reflection of humor, but of President Bush’s interest in people, especially in his counterparts abroad, the PDB introduced another element, briefs on the public activities of the president’s counterparts. We would learn that from time-to-time the president was inspired to call one of those leaders and chat with someone doing some- thing interesting. a. Hank died of complications from the disease on 16 December 2018, and in Hank’s obituary, his family remembered the presdi- ent’s kindness. While it became somewhat fashionable in recent years to downplay the president’s grasp of the issues of the day and his role in their evolution, the trend is hardly justi- fied in the minds of those who worked with him and for him. In John Helgerson’s book about briefing presidential candidates, Getting to Know the President, the former CIA Deputy Director for Intelligence made clear the seri- ousness with which President Bush took his relationship with intelligence and how important a contribution that relationship made to his presidency. in 1947. Alone among postwar Presidents, he had served as CIA Director. Also uniquely, he succeed- ed to the presidency by election after receiving full intelligence support as Vice President. These circum- stances were obviously not of the CIA’s making and may never be repeated, but they made the Agency’s job immeasurably easier at the time. The good relationship was also a result of Bush’s deep personal interest in developments abroad and his experience as a diplomat representing the United States in Beijing and at the United Nations. More than any other President, he was an experienced consumer of national-level intelligence. Also of critical importance was the fact that he had a highly capable and experienced National Security Adviser in Brent Scowcroft, who was determined to see that he received good intelligence support. And those of us who helped in the process were truly enriched. The space telescope team of the month in June 1984. Sam Palasciano is in the center with jacket and red tie. The names of some of the team are identified in the next two photos. See the next photo for the names. Names of the space telescope team. Many of them also worked on the Hexagon program. Both great successes and a tribute to Perkin-Elmer. By the early 1980s, the HEXAGON reconnaissance satellite program was scheduled to end. Only a few more of the heavy, schoolbus-sized spacecraft were under construction. Efforts by senior Air Force officials within the Los Angeles office of the highly classified National Reconnaissance Office (NRO) to either build more spacecraft, or use the Space Shuttle to recover and relaunch one or more of the last satellites, had been rejected as impractical or too expensive. The NRO leadership in Washington instead chose to stretch out the remaining launches, keeping the satellites in orbit longer and taking more images. The HEXAGON had a powerful dual camera system also known as the KH-9 and capable of imaging almost the entire Soviet landmass in a single mission. Because of that, the 20th and last HEXAGON spacecraft, scheduled for launch in spring 1986, became very important to many members of the intelligence community. Despite the fact that it was a revolutionary improvement in photographic reconnaissance, the clock started ticking on HEXAGON only five years after its 1971 debut. But what has not been known until now is that the last HEXAGON spacecraft acquired an additional top secret sensor and intelligence mission in addition to its primary job of taking medium resolution photography of vast amounts of territory. The spacecraft was also supposed to fly twice as long as any previous HEXAGON mission. On April 26, 1986, the last HEXAGON spacecraft—which was euphemistically referred to as “the big bird” by launch crews—lifted off atop a Titan 34D at Vandenberg Air Force Base in California. And then the rocket blew up. Despite the fact that it was a revolutionary improvement in photographic reconnaissance, the clock started ticking on HEXAGON only five years after its 1971 debut. In late 1976, the National Reconnaissance Office launched the first KH-11 KENNEN near-real-time reconnaissance satellite. From its orbit traveling over the poles, KENNEN could image the ground below and send its signals up to a satellite in a much higher orbit that could, in turn, relay that image back to a ground station outside of Washington, DC. At that ground station, the image would be printed out on a film transparency where it could be viewed on a light table by experts on Soviet Union weapons and facilities. All this could happen in about an hour. The KENNEN was a fancy new tool in the American satellite reconnaissance toolbox. But it came with limitations. Throughout the late 1970s the NRO continued launching both HEXAGON and KENNEN spacecraft, as well as the smaller, but very high resolution, GAMBIT spacecraft. HEXAGON and GAMBIT both returned film to the Earth in reentry capsules. This took longer than KENNEN, but both spacecraft could do things that KENNEN could not do. HEXAGON performed “area search,” meaning that it scanned huge amounts of territory, each sweep of its cameras covering a distance east to west equivalent to the distance between Washington, DC and Columbus, Ohio. Not only did the images cover vast areas, but the camera resolution was so good that photo-interpreters could look at the film and accurately count and identify tanks and planes and missile silos and look for any changes. GAMBIT, whose KH-8 camera imaged much smaller areas than its larger counterpart, was like a high-performance spotting scope. The GAMBIT took photographs so detailed that they could be used for technical assessment of Soviet weapons systems, like analyzing nuclear reactor components before they were installed in a submarine, measuring the control surfaces on airplanes, or determining how much fuel was inside a missile. In the late 1970s, the NRO undertook several studies of ways to replace HEXAGON. One program, named ZEUS, would have taken advantage of the shuttle’s unique capabilities to operate in orbit while carrying payloads, and to launch and retrieve satellites with regularity (see “Black ZEUS: The top secret shuttle mission that never flew”, The Space Review, January 30, 2017). None of these options were very attractive, so the NRO kept purchasing more HEXAGON spacecraft and stretching out the amount of time that they were in orbit by returning their four film return capsules at longer intervals. According to an official history of the HEXAGON program, analysis indicated that the greater territorial coverage achieved by these longer intervals was more valuable than quickly returning the imagery to the ground. In addition to stretching out the HEXAGON launch schedule, the spacecraft were also modified to increase their capabilities. KENNEN was not originally pitched as a replacement for HEXAGON and GAMBIT, but by the later 1970s, as budgets were getting tighter, people within the intelligence community began claiming that KENNEN could do both the HEXAGON and GAMBIT missions. According to a former NRO official, “the company line was that ‘K’ could replace ‘H’ because it had some broad area capability.” The official’s response to this was an expletive. The KENNEN “could take large scale [photographs] by off-pointing,”—meaning looking off to one side instead of straight down—“but it was still a single strip or a single frame. It didn't have the broad area synoptic coverage of HEX. Sure, it took over for HEX, but it couldn't do the HEX mission. But you couldn't afford both, so they went with KENNEN,” he remembered with some bitterness. “It has been my experience based on what has been done over the last 30 years that when you try to come up with a single system to take over the missions of two separate focused systems, you come up with a compromise of both missions that doesn't do either as well as the focused systems,” the NRO official said. An illustration of an S-Cubed camera. When the United States Air Force began developing reconnaissance satellites in the 1950s, soon thereafter the US Army, which then had responsibility for military mapping, became interested in using satellites for mapping purposes. Initially the military’s plan was for separate mapping satellites—an early one was named ARGON—but this soon evolved to carrying mapping cameras as secondary payloads on reconnaissance satellites. Starting with the fifth HEXAGON in 1973, a mapping camera was added to its nose along with its own film-return vehicle, and these payloads flew on HEXAGON until the sixteenth vehicle launched in 1980. The seventeenth HEXAGON, launched in 1982, eliminated the mapping camera and used the main cameras for mapping purposes, something made possible by a new technology. According to a former NRO official, “the company line was that [KENNAN] could replace [HEXAGON] because it had some broad area capability.” The official’s response to this was an expletive. One of the primary requirements for a mapping camera is to precisely record the position of the terrain in the photographs so that the photos can be stitched together to form large scale maps. One of the things that prevented the HEXAGON’s main cameras from being used for mapping was that the location data for each image was not precise. The satellite had stellar indexing cameras that periodically took photos of stars that could be compared to known star maps to determine the exact pointing of the spacecraft. But these cameras only operated periodically, and during the intervals between stellar index camera fixes, gyro data was used to correct for spacecraft motion relative to the Earth. By the late 1970s, engineers at Perkin-Elmer Corporation, who had designed the HEXAGON’s powerful dual camera system, came up with a way of providing much more precise data about where the HEXAGON’s main cameras were pointing. They did this by adding a new camera system to the spacecraft known as the Stellar Solid State: the S3 or “S-Cubed” camera. 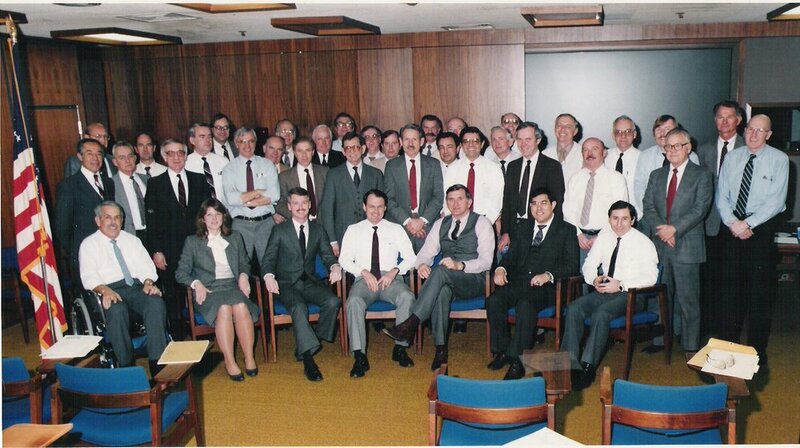 Tom Alesi was an engineer who had been at Perkin-Elmer since the beginning of the HEXAGON program in the mid-1960s. “I started before we even had a building,” he recalled. Throughout the development of the main camera system and then the flights in the 1970s he worked on various projects associated with improving HEXAGON, making it better and doing other tests. For instance, after reports that the shuttle Challenger had been illuminated by a Soviet laser during an October 1984 flight, Alesi worked on a project where they rented a commercial laser and shone it into the optics of the HEXAGON engineering test camera. The laser damaged the camera shutter, but didn’t damage the film which was moving at high speed through the camera. Despite the obvious threat to HEXAGON, “I don’t think we did anything about it,” Alesi recalled. Alesi explained that the origin of the S-Cubed was the desire by Perkin-Elmer’s leadership to expand their products. “We were trying to get into the star-tracker business,” he explained. They wanted to compete with Ball Aerospace which was a leader in the business. One of their incentives was that they discovered that the Hubble Space Telescope, which had not been launched yet, had star trackers that used a lot of power, and they wanted to come up with an alternative that was less energy hungry. Once they had developed and flown several of the S-Cubed star trackers, however, they found that they had a hard time selling them. Customers wanted to know if the star trackers had flight experience, but the HEXAGON missions that had used them were classified. The S-Cubed consisted of two cameras that used charge-coupled devices, or CCDs. CCDs turned light directly into electronic impulses. They had been invented about a decade earlier by Bell Laboratories, probably with at least some CIA funding. A CCD array formed the basis of the image capturing sensor inside the KH-11 KENNEN reconnaissance satellites, and Perkin-Elmer’s engineers had sought to add this technology to the HEXAGON in a supporting role. What the S-Cubed system could do was record continuous stellar fixes, meaning that the spacecraft did not need to rely on the less accurate gyroscope information. That enabled the main cameras to be used for mapping purposes and the extra mapping camera on the spacecraft’s nose was eliminated. Other changes increased the film load and enabled more of the film to be used. A former NRO official explained how the S-Cubed cameras worked. “The two normal S3 cameras were mounted on the port and starboard sides on the front of the Two Camera Assembly (TCA) behind closeable doors in the mid-section structure and looked up, out and back of the vehicle to capture star transits across the CCD linear arrays as the vehicle moved through its orbit. The data was recorded on the vehicle telemetry tape recorders for playback to the ground and subsequent star centroid processing.” The cameras were mounted directly to the frame that also held the HEXAGON’s two main cameras, which meant that their angular relationship to those cameras was precisely known. Just what exactly those S-Cubed sensors saw on missions 18 and 19 while flying over the Soviet Union at nighttime when the spacecraft was rolled at an awkward angle remains classified. Because the stellar cameras looked at the stars, pointing one of them at the ground was a substantial maneuver, flipping the bus-sized spacecraft head over tail in orbit. This used some of the reaction control system (RCS) gas. And because there was a risk that the spacecraft could get stuck in this position with its main cameras pointed out toward space, controllers only performed this pirouette at the end of the mission. The 19th HEXAGON spacecraft, launched in 1984, also carried an S-Cubed camera system, and it too was successful during the tests. Unfortunately, that spacecraft experienced control problems that caused the ground controllers to cut the mission short. They loaded up all the film into the first three reentry vehicles and brought them down more quickly than usual out of concern that the spacecraft might die in orbit with film still aboard. Where the S-Cubed cameras were mounted on the final HEXAGON. Just what exactly those S-Cubed sensors saw on missions 18 and 19 while flying over the Soviet Union at nighttime when the spacecraft was rolled at an awkward angle remains classified. “They knew the Russians were doing stuff at night that we couldn’t see,” Alesi explained. Intelligence officials had long been concerned about Soviet “denial and deception” efforts where they sought to hide activities, sometimes by conducting them at night. Tom Alesi was put in charge of adding the additional S-Cubed camera to the spacecraft. There was no special designation for the project, no special program number. In fact, Alesi said that at Perkin-Elmer they only referred to the HEXAGON project as “Program 1” or “P1.” “HEXAGON or KH-9, that was a no-no,” he remembered. “It was always P-1.” They even used shorthand for all the components. The film platen, which held the film flat for exposure to light, was called “the PL” and the device that looped the film was called “the LO.” They reached a point where they had a hard time remembering the actual names for the parts of the camera system. Phil Pressel remembered that nobody at Perkin-Elmer ever mentioned the name of the customer—initially the CIA and later the US Air Force component of the National Reconnaissance Office. They were always referred to as “the customer.” All of this in the name of secrecy. Alesi had to figure out the engineering for the special S-Cubed camera system. “It was mounted in the area between the film supply and the Two Camera Assembly,” he recalled. They cut a hole in the spacecraft so that the camera could look down at the Earth. They hired Schwartz Industries to produce a frame for holding the camera, milling it out of a large piece of aluminum about one meter square. Alesi remembered that each time he submitted his design the orders came back to make it stronger, so the frame got thicker and thicker. “They crammed all they could on Vehicle 20 since it was the last and they knew there were some collection requirements and subsat missions that wouldn't see any new data or opportunities for a long time, if ever,” the former NRO official explained. Because of this new sensor, the last HEXAGON mission now had the ability not only to conduct infrared observations during its primary mission, but also to keep operating long after its primary mission was completed. It could orbit the Earth, taking infrared images of the Soviet Union until it ran low on reaction control thruster fuel. According to a mission report, the primary mission involving the main cameras was scheduled to last 300 days, longer than any previous HEXAGON mission. But then the spacecraft would continue to orbit on a “solo” mission for an additional 240 days, operating its infrared S-Cubed camera—a year and a half in orbit, twice the previous longest mission. In addition, the last HEXAGON also carried a deployable sub-satellite called Pearl Ruby. The Defense Advanced Research Projects Agency (DARPA) had started the Ruby series of infrared experiments in the mid-1970s. The most well-known—and notorious—was Teal Ruby, a spacecraft program that kept experiencing delays throughout the early 1980s and had been scheduled to be the first military payload launched on the space shuttle from Vandenberg Air Force Base. The explosion of the space shuttle Challenger in early 1986 ended plans to launch the shuttle from Vandenberg and grounded Teal Ruby. Although the specifics of Pearl Ruby are unknown, it was probably an infrared detection experiment mounted on a small spacecraft similar to those that had been carried on numerous earlier HEXAGON missions. Besides DARPA, the NRO was increasingly interested in infrared observations of the Soviet Union during the 1980s, and at some point, a new infrared observing capability named DRAGON was added to the KH-11 satellites. According to a former CIA analyst who was aware of DRAGON, it was a substantive improvement to the KENNEN, and almost certainly far more capable than the S-Cubed camera because it saw further into the infrared, meaning that DRAGON’s infrared targets did not need to be as hot to be detected. There was a lot riding on this last HEXAGON launch. “They crammed all they could on Vehicle 20 since it was the last and they knew there were some collection requirements and subsat missions that wouldn't see any new data or opportunities for a long time, if ever,” the former NRO official explained. The destruction of the Titan IV carrying the last HEXAGON satellite. Alesi remembers that he flew out to Vandenberg in April 1986 for the launch. He was watching it as the Titan 34D rocket rose above the launch pad and then blew itself to smithereens, raining debris down on the pad and surrounding area, starting small brush fires and damaging buildings and some vehicles parked near the pad. It was a devastating end to a program that many people had spent their entire careers working on, and had poured their hearts and souls into every mission. Phil Pressel, who had worked on HEXAGON since the mid-1960s, remembered going back to his office and crying. All their hard work had culminated in a spacecraft that was now splattered all over the smoking scrub brush on the central California coast. An investigation revealed that some insulation inside one of the rocket’s solid boosters had come loose, allowing exhaust gases to escape and burn through the casing, leading to a rapid explosion. According to a person who worked at Vandenberg at the time, a tracking camera following the liftoff had a single frame that showed the payload fairing blown off, revealing the HEXAGON satellite underneath. Security personnel cut that frame out and spliced the film back together. (See “Death of a monster,” The Space Review, December 15, 2008.) After Alesi went back to Perkin-Elmer’s facility in Danbury, Connecticut, he later talked to somebody involved in the laborious process of cleaning up the classified debris. That person told him that they found the sturdy aluminum frame that held the additional S-Cubed camera. It was still intact: clearly more than strong enough. Dwayne Day would like to hear from anybody else involved with the HEXAGON program, the S-Cubed camera, or Pearl Ruby. He can be reached at zirconic1@cox.net. 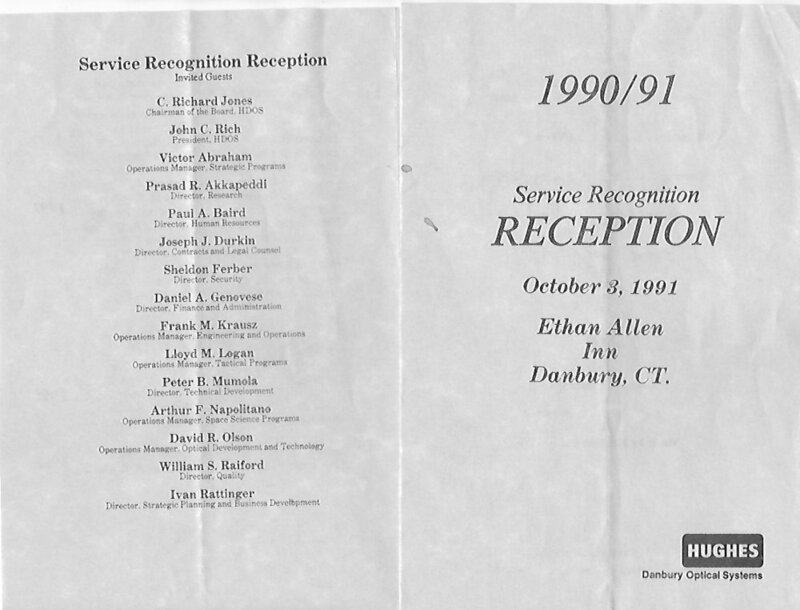 In going through my old documents and souvenirs I found this old Service Recognition Dinner Reception Program that I attended with my wife Pat on October 3, 1991 at the Ethan Allen Inn, Danbury, CT. Unfortunately some of them are no longer with us but they were all wonderful colleagues that I worked with and many of us became good friends. I hope you have as many good special memories of them as I do. They were all talented members of the fantastic team that worked on and contributed to the success of the Hexagon Reconnaissance Satellites that helped keep the peace in the world for 15 years between 1971 and 1986. Many also worked on other high performance projects such as the Hubble Space Telescope, and some worked on important and successful classified programs. I have been and still am proud to have worked with them. It has been so many years since we had PDR’s, CDR’s and other reviews. The hardest ones were the internal ones that we had to do for Perkin-Elmer’s own upper management including Arnie Wallace who really made you sweat. These were followed by the real ones for our customers and their consultants. Some of their questions were tough and some were inane such as “when do you expect to get your connectors delivered.” I remember Marty Yellin starting his presentation with a questions for John Love, a customer consultant “Any questions so far John?” Here is a photo and an identification chart of one of the last Program Review in the mid eighties.